Click on the bars below to all the subdivisions and condo & townhome complexes in Erie. You can also view the most popular searches such as ranch style homes, new construction, homes with a pool or houses with mountain views. Click to see Local Subdivision and Complex Maps. What is Your Erie Home Worth? Erie, Colorado is a small town nestled ideally along the I-25 just 30 miles from downtown Denver, with Dacano directly to the east and Boulder to the west. Increasingly, Erie, CO is becoming a go-to location for homeowners seeking a relaxing living environment that sits within close distance of Denver. An excellent commuter town, Erie is drawing in families who want to experience living in the natural wonders of Colorado but have access to the amenities of Denver. 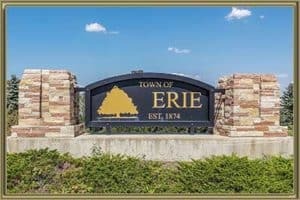 As homeowners embrace the potential of Erie, the town is responding with a fantastic selection of home choices in an array of subdivisions. For professionals seeking an urban feel on the commuter belt, Erie, Colorado has complexes in Brennen by the Lake Townhomes and Heritage at Vista Ridge Condos. New Subdivisions attracting family-based homeowners include Lost Creek Farm, Vista Ridge, and Colliers Hill. These subdivisions offer a wide range of home choices that suit most budgets and tastes. At the high-end of the scale, luxurious properties are available in both Candlelight Ridge and Highland Farms. Erie also has a special subdivision that caters to all the fliers out there in the form of the Erie Air Park. This community includes properties that provide residents with direct access to an airstrip, providing fly in and fly out access to pilots. Erie, Colorado is a fantastic place to live if you want to be close to Denver, but also want to connect with the great outdoors. With that in mind, the town provides residents with plenty of access to Mother Nature. Colorado is home to some of the most beautiful landscapes in the country, and residents in Erie can embrace these natural wonders from within the community. There are several parks, trails, open spaces, and forests in Erie, including Thomas Reservoir and Erie Lake. These two open spaces provide acres of land for residents to explore, and access to water-based activities through the summer months. For a relatively small town, Erie, Colorado gives residents access to a good range of local and brand retail, restaurants, and nightlife. Of course, Denver is ideally situated, allowing people living in Erie easy transportation to the full amenities of a big city. A fantastic option for homeowners seeking a balance of urban and outdoor living, Erie is becoming an increasingly popular choice. The market is vibrant and competitive, so teaming with an expert when buying a property can give you an edge. Gold Compass Real Estate is a leader in the Erie market, with our qualified team able to give you confidence and knowledge when searching for a home. While homeowners are flocking to Erie, some are looking to sell existing property within the town. Gold Compass Real Estate is available to help you sell a home in Erie, Colorado, including organizing staging and consultations. An important first step of selling any property is understanding the value of the home, so check out your free Erie Home Value Instantly Online from Gold Compass Real Estate. See a list of attractions and Things to do in Erie. Gold Compass Real Estate has built a reputation for working with customers to reach the best outcomes. Our qualified team of agents has local experience in Erie, Colorado, allowing them to give you information on pricing trends, schooling systems, and the best subdivisions to look at. To help you get underway, we host all listings in Erie online, a database that is updated every time a home is put up for sale or sold. Take a look at the complementary Free Personalized Market Report for more information on the market in Erie, Co. For more information on moving to Erie, contact us at 305-325-5690.